There can be no loitering or congregating inside the building during camp hours. On Wednesday, June 20 from 7 to 8:30 p.m. in the auditorium, the focus will be on food, friends and fun. Come out and rejoice for summer with a dessert and appetizer potluck. Bring something to share. Beverages and table settings provided. Celebrate our recent accomplishments and offer your wish list for the coming year. Preview a special presentation of the touching new documentary Joby’s Run – A migrant from Australia and his trusty bulldog feel isolated in their new home city of San Francisco until finding an unlikely solace in the form of a small urban dog park. Want to help? Email info@noevalleyreccenter.com. This fall marks ten years since Rec & Park transformed Upper Noe Recreation Center into an attractive community center. And it looks just about as good today as it did then. 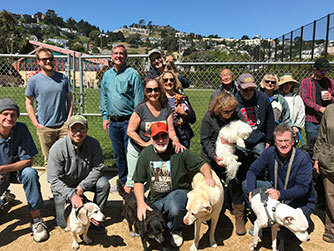 To mark this accomplishment of stewardship and the wonderful Upper Noe community, local organizations have joined together to host a neighborhood-wide block party at the park. FNVRC, Upper Noe CRC, Upper Noe Neighbors, and FUNDOG invite everyone to join in the fun on Saturday, September 15 from noon to 4. Do you have some great ideas? Want to help? Would you like a table for your organization? Email info@noevalleyreccenter.com. Rec & Park Survey – Win a $50 Gift Card! Junior Giants Registration is Open. Don’t Miss this Pitch! Captain Hart will focus on emergency readiness, including NERT and SAFE. Tuesday, June 19, 7 – 9 p.m.